Over on the family scrapbooking blog my mom, sister and I are sharing pages using Pantone’s color of the year for 2014 “radiant orchid.” Ironically although I love the color purple and have quite a bit of it in my wardrobe I have a very hard time scrapbooking with it. Since I tackled this challenge with a different approach than usual, I thought I would share more about my process here. I do not often start pages with a color palette in mind. My trigger is almost always photos or story. When we first decided to tackle radiant orchid, though, I didn’t have any photos or subjects that came to mind. My next step, then, was to search Pinterest for “radiant orchid” for a color combination that I liked. One of the first hits on my Pinterest search was this article that had several different color palettes using radiant orchid. 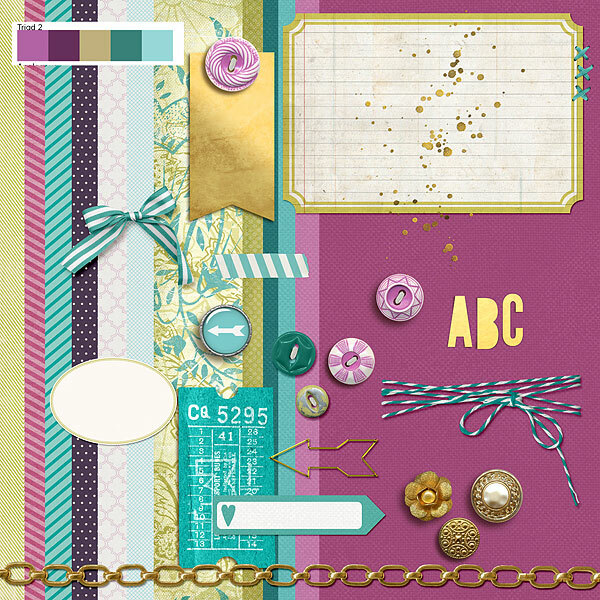 I really liked Triad 2 because it used one of my other favorite colors – turquoise – and decided to put together a “mood board” of supplies to match the color combination. The mood board was easy and fun to do because my supplies are tagged by color. I started by finding the right shade of purple and then moved to metallics, blue and green. While searching through my stash I found a great patterned paper from the Garden District Paper Pack by Katie Pertiet that featured the right shades of green and blue and had the idea that I would make it my “focal” patterned paper with pops of radiant orchid. One thing to note about the mood board is the gold elements. This is not a color I would have normally matched with purple, but I saw it used pretty frequently together with radiant orchid in my Pinterest search. 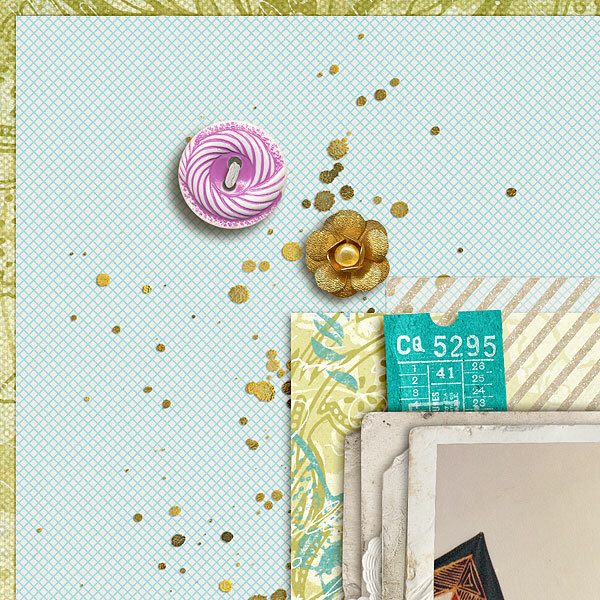 I’ve also noticed that gold elements have been popular in the digi scrapbooking world, so I threw them on to my mood board. Once I had my mood board complete, and I STILL did not have a story in mind, I started trying to layout my page using the papers and elements on my mood board. Eventually I decided to try out one of the Scrapbook Coach classes (these have become my go-to when I’m looking for a “template”) and finally ended up with a fun story. Here’s a sneak peak at the final result, I’m quite proud of how the page turned out given the how difficult it was to get started. You’ll have to check out the blog post over on Scrapping Two by Two for the full result!